Another great offer of 4* Oman Air from Milan this time greatly discounted round trip flights to Malaysia incl. travel dates next high season in winter season 2018/2019! Cheap flights from Milan to Kuala Lumpur are availabel already for €351 incl. all taxes and fees, in-flight meals and checked-in bag. At this moment great availability but some of the flights may require long layover in Muscat on your inbound flight. Consider to book multi-city flights and visit two different cultures at once. We are adding both options below as well as links to our previous deals to Bangkok or Zanzibar. Oman Air offers discounted deals when traveling from Milan to Kuala Lumpur from end of August 2018 to March 2019. Blackout period around Christmas Holidays. Max stay 3 months. Oman Air promotion is running till 8th of August. 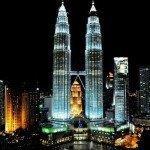 Need some cheap accommodation in Malaysia you can book your hotel room via Booking.com or Hotels.com. Great availability next main tourist season but only few seats on each travel dtae so hurry up with your booking if this is something interesting for you..
Booking sample of cheap flights from Milan to Kuala Lumpur already for €351! As per our above deal your outbound date from Italy to Malaysia would be on Saturday, 19th of January. Inbound flight from South East Asia in peak season back to Milan then on 5th of February 2019. Do not miss this excellent Oman Air promotion if you want to fly to Malaysia next high season.